Promise of fresh and healthy bread for dinner, in minutes! Do you always make fresh bread for dinner? a) Do you always make bread for Indian Dinner at home? 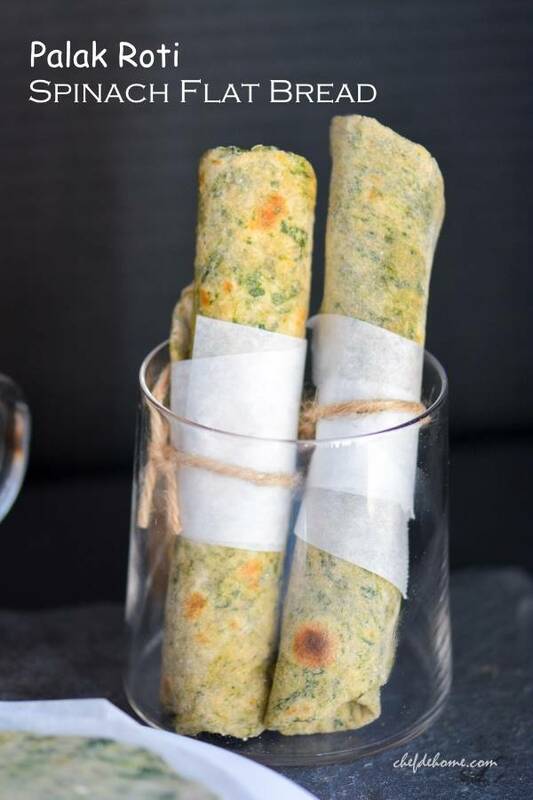 Or b) Bring that pre-rolled roti packet from store? If your answer is (b), I can help you make the same bread at home, in advance, almost like bought-from-store-ready! How good does that sound? In Indian cooking, breads are made just before eating. Since Indian flat breads, specially the ones consumed at home, have no leavening agent like baking soda or yeast or eggs. So if cooked and kept for long, these simple bread go dry and rigid pretty quickly! Hence, are cooked just before serving. I never froze bread (actually, I hardly even cooked bread! lol!) before marriage. I bet, 90% of home cooks in India still don't freeze breads. When you get expert in rolling and cooking flat breads, making few breads for dinner becomes "a piece of cake". Really, I mean it! But things were very different when I started cooking and was also working full-time 9-6 jobs. Thing is, IT companies love to make you stay late, often, to finish even tomorrow's work in advance. j/k but... yes, Computer Engineer's job often gets stretched to 9pm, easily! So, on those days, I faced a big challenge, challenge of putting dinner on table, 10pm at night. I was not a foodie blogger or expert cook, or even had no clue about miracles-of-slow-cooker at that time. Often, when it got too late, my day looked like, dinner at 11pm, cleaning by 12, sleep quickly, and show up again in kitchen at 5 am. So, one day, I spent 4 hours over the weekend and rolled Stuffed (for Breakfast) to Plain Flat Breads (for dinner). Meticulously made batches of 4-breads-each-ziploc and froze! That week I had lots of "Aha" moments! And I never looked back again. Always made sure to keep a batch of homemade "Roti" for dinner and breakfast in freezer. Even though my weekend got even more busy. 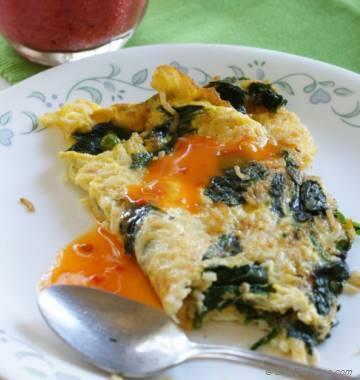 The life became really good for weekday dinners. I never froze cooked breads like many people prefer to do. I froze uncooked breads. So, end experience was still a fresh bread, yet I saved time of kneading or rolling breads. And if I was alone stuck at work, Vishal had option to take-out few breads, sear and have dinner! Today, I have complied this post to share with you method of freezing and cooking uncooked flat bread. All you need: basic flat bread ingredients, 20 spare minutes, few round-cut sheets of parchment paper or cling wraps, and large size ziploc bags for easy storage. And I promise you never have order a bread from store for dinner! 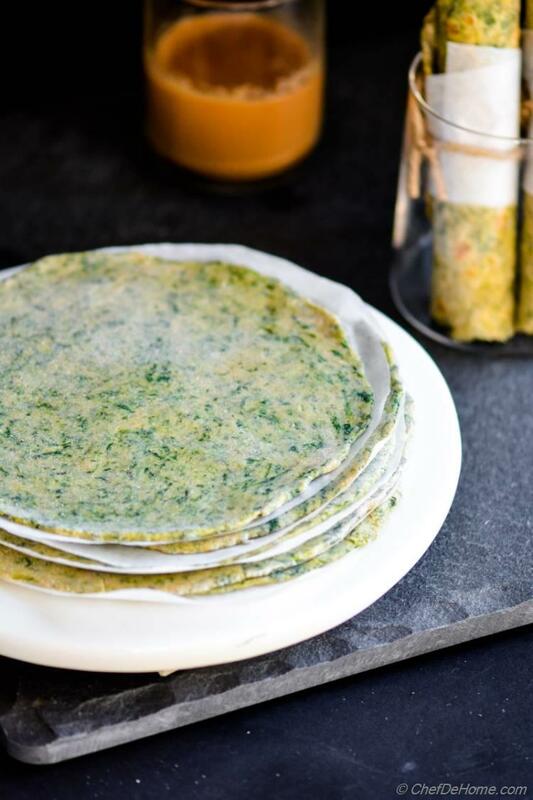 Not just Indian food, these healthy, whole wheat, spinach-packed flat breads are perfect to serve with stews, or even for tacos! I often use this bread for tacos! Now, I will stop chattering and direct you straight to the recipe instructions. I hope this will help you feed fresh bread to your family, specially when your are time pressed. Flat bread will stay good in freezer for up-to 1 month. How about some delicious curries for an Indian Dinner at home? 1. 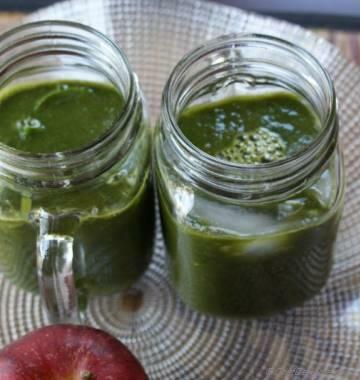 Blanch spinach, let it cool slightly, then squeeze all water and add to a bowl with flour, salt, black pepper, and oil. 2. 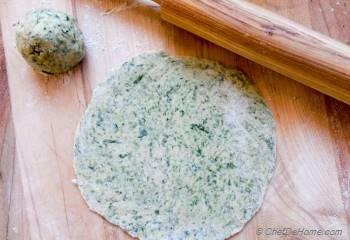 Since spinach is wet, just work on the dough with hand without adding water until dough comes together. 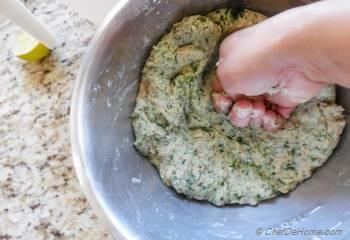 Rub the flour and spinach together to make the process easy, then add water 1 tbsp at-a-time until dough comes together. 3. 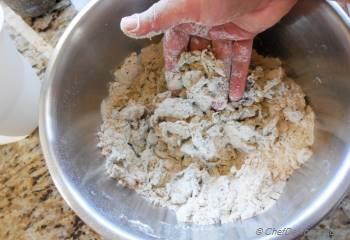 Knead the dough with fold and punch action for 2 minutes, then set aside. 4. 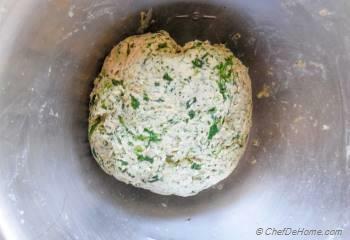 While dough is resting (10-15 minutes), cut 10, 4-5 inch diameter discs of parchment paper and set aside. 5. Make 10 small tennis-size balls from rested dough and place on a flour dusted board. 6. 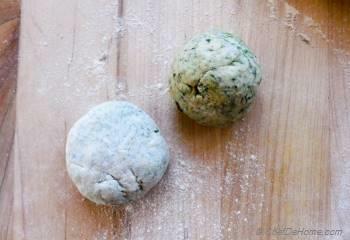 Roll each ball into 4-5 inch diameter circle with rolling pin. Keep placing on a plate/tray with one parchment disc in-between. 7. Once you have rolled all roti, there will be a stack of roti with parchment-paper lined between all. 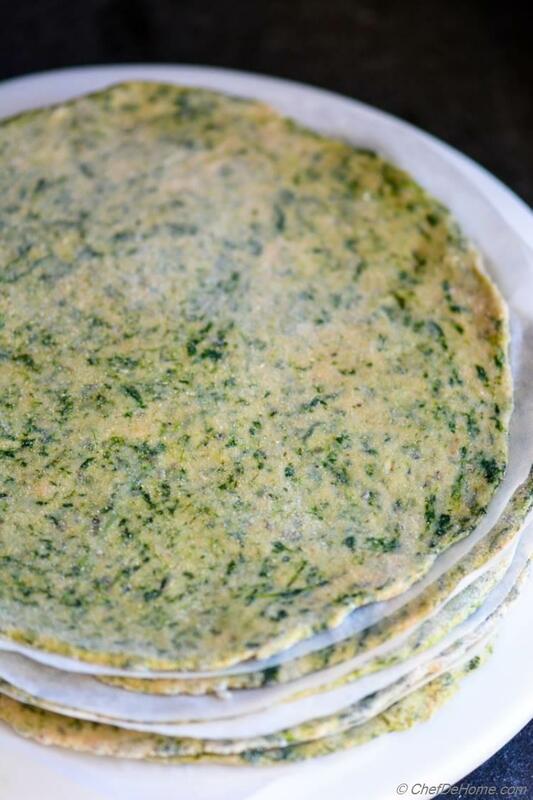 This prevents flat breads from sticking together when frozen. 8. Carefully transfer pile of rolled roti in a ziploc or plastic bag. Place in freezer on a flat surface so that roti stay flat when freezing. 9. Cooking Instructions: When your want to use flat bread. Heat a flat griddle. 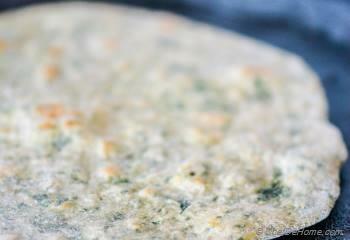 Take out frozen roti and remove as many as you want. 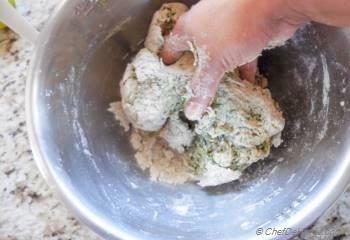 Pull roti with pressure on parchment so as to separate without breaking roti. Sear frozen roti on hot griddle for 1-2 minute each side until brown spots appear all over. Don't feel tempted to flip until one side of roti is fully cooked. If Roti appears to be stuck it will come out as it gets fully cooked. 10. Slather cooked roti with a little bit of butter for more flavor (optional) Serve for dinner or roll and pack-to-go for breakfast! Shubha, thanks! Glad you found it useful! 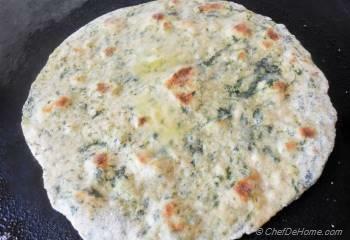 :) Farin, I'm sure you will love palak roti too. Do try sometime. 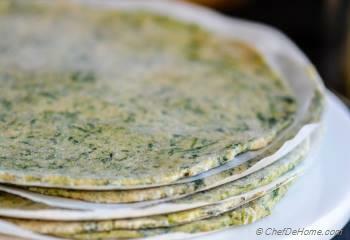 Mira, thanks :) me too finished a batch of spinach with these rotis. Anu, thanks! I agree, it all depends on time! The best part is, getting good homemade food on dinner table! I'm glad you like it. I'm sure you will love the convenience if you try! My answer is a) :D I always make my roti/paratha at home. I know what you mean, it's so easy for me now and I make flatbreads fresh all the time but initially it wasn't this easy. 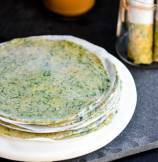 This is great for beginners or anyone who's looking to save some time in rolling rotis! I love this! 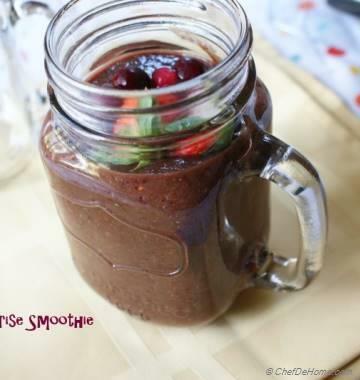 A great way to get some extra vegetables in to your diet too. Cannot agree more, Dannii! Indeed a good way to eat more vegetables.